True Siam Hotel offers air-conditioned rooms in Bangkok's Pathumwan District, a 4-minute walk from the Phayathai Airport Link Station and Victory Monument BTS Skytrain Station. Free Wi-Fi and a restaurant are available. 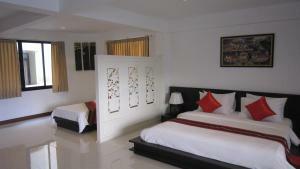 Decorated in a modern Thai style, the spacious rooms come with a private balcony and dark wood furnishings. Each is equipped with a flat-screen cable TV and a minibar. The 24-hour front desk provides services like luggage storage and foreign currency exchange. The hotel also provides a tour desk and laundry services. The hotel's restaurant serves a daily buffet breakfast, as well as a selection of Thai and Western dishes. In-room dining is possible with room service. Please Note: This hotel requires a deposit of THB 1,000 due at check-in. Guests are required to show a photo identification and credit card upon check-in. Please note that all Special Requests are subject to availability and additional charges may apply. A damage deposit of THB 1000 is required on arrival. This will be collected as a cash payment. You should be reimbursed on check-out. Your deposit will be refunded in full in cash, subject to an inspection of the property. Rooms feature a private balcony, a flat-screen cable TV and a minibar. Rate: THB 1595.00 ... THB 3275.00; select dates below to get current rates. Rate: THB 1850.00 ... THB 2100.00; select dates below to get current rates. Spacious room features a kitchenette.